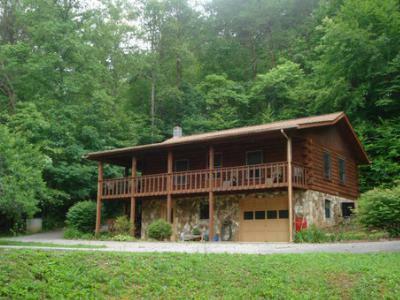 Log home with paved access on 2 private acres. Newly stained exterior, Open Floor Plan w/Vaulted Ceiling, Wood Walls, Exposed Beams. 3 Bedrooms. 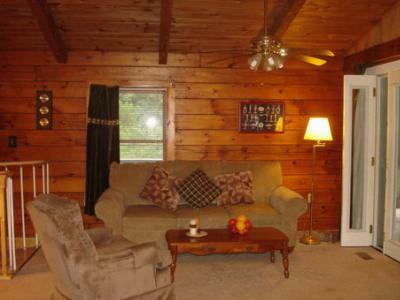 Lower Level has Bedroom, sitting area, full bath and woodstove. Central H and A, Covered Porch to enjoy the view, Storage Building, Fenced Garden Spot. Most Furniture Conveys, Handicap ramp to main level. Land lays very nice and some is cleared. Owner is avid gardener, has perennials and raised flower beds. Very energy efficient, low utility bills. Schools servicing this area include Iotla Valley Elementary, Mountain View 5-6, Macon Middle and Franklin High School all within 15 minutes of this home.